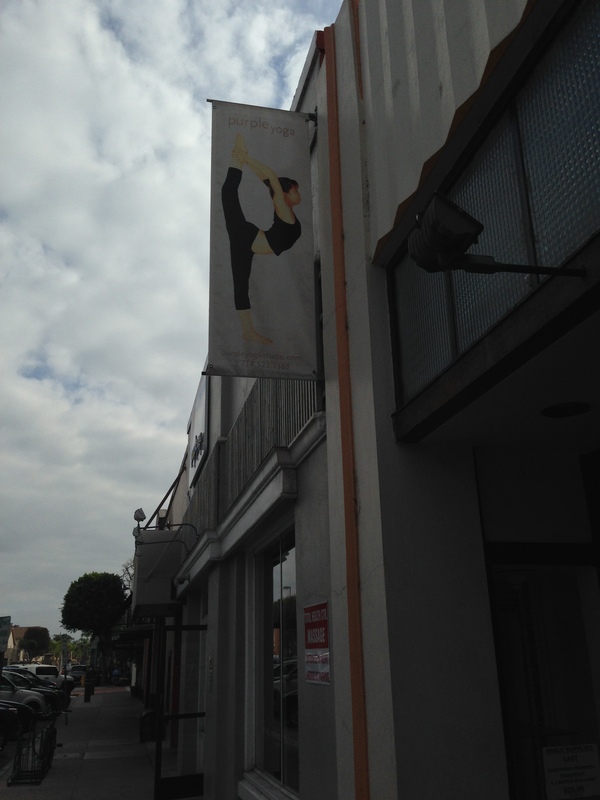 Hot Yoga at Purple Yoga in Fullerton. I had a couple meetings for work in OC today. There was a big enough break between them, that I was able to squeeze in a yoga class at lunch time. I yelped and found a local spot Purple Yoga. It turned out to be a HOT yoga class. Usually, they have “bikram” in their name or description. I was a little surprised when I walked into the room. I typically sweat a lot at yoga, even without the elevated temperature. Needless to say, I was sweating buckets during this class. Hilarious. The class was great. The instructor sat the whole time and verbally walked us through every pose. In some twisting, one-legged, pretzel triangle tree pose, I couldn’t hear her cuz my ears would fill with sweat. I had to look around and see what the others were doing. I tried to focus on my own positioning, cuz it’s mostly women and I didn’t want them to think I was totally pervy in the mirror. I felt the heat really helped me loosen up, but my clothes were sticking too me so much I had to peel and move them to change poses. I like to sweat in general because it cleans out the pores and feels good deep inside. But, this was crazy sweating. In one strenuous pose I got woozy and had to take it easy for a round. Fortunately, they had a locker room and a shower, otherwise I would have had little sticky situation for my second meeting. The cool shower really helped cool off my core temperature. I also felt heat sucked the life out of me. I was kinda sleepy the rest of the day. Second round of coffee once I was back in the office. Interesting and fun. Learned something new everyday. But, probably not gonna do hot yoga again. ← CompuTrainer. Cape Henlopen Triathlon.